Just Property Kimberley has been in operation since 2004. 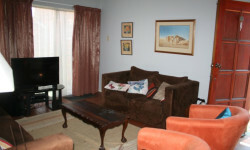 Serving the community of Kimberley mainly in the residential letting arena. Since our start in October 2004, the branch has grown into the largest residential letting company in Kimberley and the Northern Cape. During 2016 the branch has expanded to include sales in the residential and commercial arena. We put servicing our customers with integrity and transparency first. We value two-way communication and listening to our clients needs. We are property professionals with a passion for what we do. Say the name Kimberley, and nine times out of ten the phrase evoked by the name will be ‘big hole’. And indeed, Kimberley, the capital of the Northern Cape that is a perfect detour on the N12, just off the N1, that functions as an alternative route between Cape Town and Johannesburg, is ‘the’ place for diamond mining. It not only has a history immersed in diamonds but the Big Hole - a huge circular pit right in the middle of town - is a huge crater dug almost entirely with picks and shovels in an effort to reach the stones. Kimberley’s Big Hole, measuring over a kilometre deep with a surface area of 17 hectares (although it isn’t the biggest hand-dug hole; the Jagersfontein Mine takes the credit for that) formed part of the diamond rush of the 1870s where men, with little more than man-made tools, managed to remove three tons of diamonds and 22,5 million tons of earth in the process. Today the hole is not as deep. Not only was it used as a receptacle in which to throw debris after it was abandoned, but ground water seeps into the hole leaving only 175 metres of the 215 metre depth visible. The Big Hole today continues to draw attention and has been converted into an open air museum with a rather daring lookout point directly over the hole. But Kimberley isn’t just about its hole, although the guided underground tours of De Beers diamond mine are always exciting. Take a walk through the historical city centre and visit the museums, monuments and art galleries that grace some of the old Victorian homes. And there’s a Kimberley ghost trail that reveals all the haunted corners of the city. During the world's greatest diamond rush, hordes of prospectors converged on the region, scouring the river banks and sifting soil in a frenetic quest for wealth. At times, there were as many as 30 000 diggers labouring all day and far into the night. Although the name Kimberley evokes images of glamour and romance, the diamond heyday was an era of blood, sweat and tears, high stakes and ruthless power struggles. Some struck it rich; others found only despair. Many emerged from obscurity to achieve fame, and in some cases, notoriety. Against an unlikely backdrop of heat, dust, flies and a jumble of tents and shacks, spacious homes began to rise from the veld. By the turn of the century, Kimberley had become the diamond capital of the world, and South Africa was well on the way to establishing herself as the most highly industrialised country on the continent. Kimberley's diamond millionaires were largely responsible for financing the Witwatersrand goldfields. Today, Kimberley is a modern city with broad, tree-lined streets, attractive parks and gardens, comfortable hotels and busy shopping centres. But the extraordinary saga of its past, an aura of adventure and drama, seems ever-present. It's easy to conjure up a picture of the diggers, loafers, gamblers and "ladies" of ill repute who once inhabited the dusty shanty town. 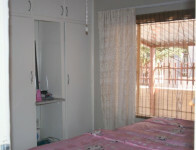 Carters Road 21, Kestellhof, Kimberley, Northern Cape, 8301.